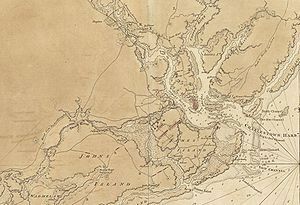 The Siege of Charleston was one of the major battles which took place towards the end of the American Revolutionary War, after the British began to shift their strategic focus towards the Southern Colonies. 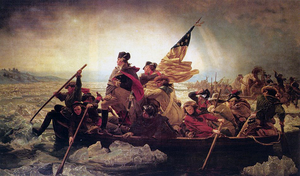 As a defeat, it was the biggest loss of troops suffered by the Continental Army in the war. At every stage the British strategy assumed a large base of Loyalist supporters would rally to the King given some military support. In February 1776 Clinton took 2,000 men and a naval squadron to invade North Carolina, which he called off when he learned the Loyalists had been crushed at the Battle of Moore's Creek Bridge. In June he tried to seize Charleston, South Carolina, the leading port in the South, hoping for a simultaneous rising in South Carolina. It seemed a cheap way of waging the war but it failed as the naval force was defeated by the forts and because no local Loyalists attacked the town from behind. The loyalists were too poorly organized to be effective, but as late as 1781 senior officials in London, misled by Loyalist exiles, placed their confidence in their rising.